General Discussion / Re: WTF is up with Mob Spawning? I'm not actually sure what's up with mob spawning. It's been lower than vanilla since before I even joined the server. I remember noticing the same thing back in 2012 when building my first spawner. Weird thing is, I've upped the spawn rates from the default value, iirc to a value even higher than vanilla, and its still low. I'll see if I can up it some more next time I get enough free time to test it all out. Awesome, Thanks, I also had some ideas for tests I could toss around and I'll run some of them when I have the chance. So when I said "tests" I really meant "a test", which I performed just the other day. The idea was simple, a repeat of my nether test, but more people involved, so that's what I did. I borrowed a few accounts and placed them in the nether. Firstly, mine in the middle of fresh chunks, then recorded entity count, then add an acc on a high platform to up mobcap, then record again, then get a third on, loading chunks but not spawning mobs, then check again. I think the line of best fit for this data would put the constant at around 15. For reference, the constant in a typical MC game sits closer to 70. The Actual calculation is based on a certain radius of chunks around the player, and is affected by player proximity. For a better explanation of this, see https://minecraft.gamepedia.com/Spawn#Spawn_cycle. Actually, I think I just found the real source of the problem, and its really simple. I know from prior testing that the server render dist is 9. I used some simple measuring to get that because I needed it to do some bedrock removal with dragon eggs. Anyway, I was reading the gamepedia article on spawning , I noticed this little gem under "notes"
So uh, yeah. Fix the problem (at least in theory) by increasing the server render dist to 10. Go Figure. Speaking of the spawn chunks, Luis, I loaded up the WDL mod just now and grabbed the spawn chunks. I?m going to load it into a locally hosted session of gnebmons carpet mod and run some tests to see how the game handles just the spawn chunks. Will update later. Ok, so the results of my testing suggest that the lag is unrelated to the overworld spawn chunks. When I loaded up carpet mod with qualia, I stood in the world spawn and used the tick warp function to jump ahead about 20 mins worth of ticks. I then waited the test out. The spawn chunks when loaded in mostly vanilla minecraft are not a source of lag, as during the tickwarp I was pulling 75ish tps. Then to simulate the spawn chunks when a player is not in the immediate, I started the same test again, but I was in spectator mode. More or less the same result. I think this effectively rules out spawn chunk based lag as well, unless its related to one of the plugins. I did find your old reddit post about this happening a year ago and there you mentioned that 1600 chunks loaded with 3 players was normal for VC? Is that still the case? because if so, the lag is prob there, if its not a plugin issue. There was also an even older post on the spigot forums mentioning doTick lag, you probably found it already, but it does suggest either a world guard issue and/or a problem with the number of worlds the server has (1-2 reccomended). Maybe thats the issue, given that VC has 6? Something I failed to mention earlier that is likely just coincidence is something that happened a few days prior to the whole lag issue starting. 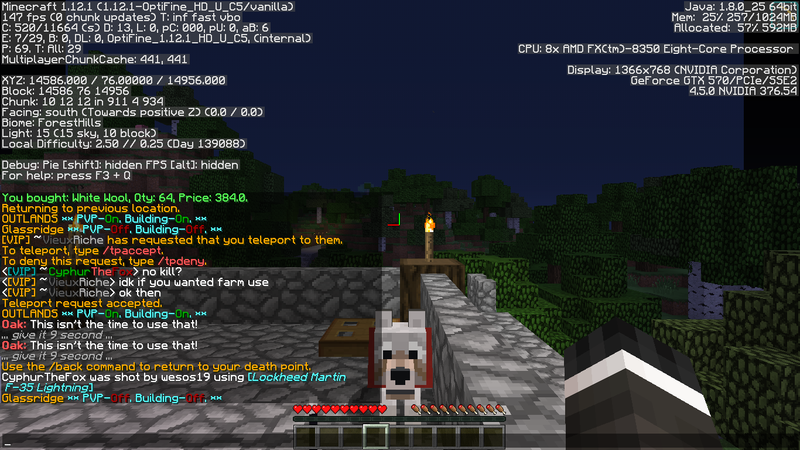 I was on the server with frog, and we were messing around with red stone. At some point we ended up on lag machines, how I'm not sure. Two pretty intricate devices with pistons and clocks and observers ensued. However, I do also recall that the machines were 1: built outside spawn chunks and/or in the superflat world and 2:turned off/disabled/destroyed. Nonetheless I did double check that the one that I did know the location of is completely destroyed. Does anyone have a base/spawner/anything an incredible number of millions of blocks away from Qualia? I have a home set 500k blocks out (/home CyphurTheFox:valley), which should unload anything but the spawn chunks and the immediate area around you when you?re way out there, given the fact that the server render dist is 9 chunks. On a side note, walking around quaila because elytra aren?t working with the lag really puts how beautiful some of the back areas are into perspective. Kudos to whomever built it. Hey Luis, Couple of things that I think may be useful. First, a note, I've been measuring the server's tps by leveraging the fact that /time also provides the time in ticks, and I have a custom script on my computer that runs the command twice with a delay of one second. 1: the lag is definitely server side. The tps measurements I've been taking reliably report back 2-3 tps, 4 if lucky. 3: the lag is not cleared by a server restart. test #2 was performed immediately after a server restart. Sorry about the lag. I'm trying to see what I can do to fix it. interrupting that. Not sure, just a theory, so I threw out a post on the support forums for dynmap asking about the effects of a server restart on the dynmap render. Also if it is a issue with the dynmap render,maybe it would be a good idea to see if its possible to render it on a different computer with a bit more graphics punch, then transfer the rendered files to the server? Update: So I got an answer, apparently there's a dynmap config option that needs to be set so dynmap can save its work across a server restart. If the following Option is set to true, Dynmap will save pending tile renders on shutdown and start over where it was when the server has started again. Loss of bal? the night that this all went down he seemed to really enjoy rubbing some 35M in people's faces. ?\_(ツ)_/? [00:56:51] [Client thread/INFO]: [CHAT] You have 125 messages! Type /mail read to view your mail. [00:56:52] [Client thread/INFO]: [CHAT] Request sent to CMTGIRL. [00:56:59] [Client thread/INFO]: [CHAT] CMTGIRL denied your teleport request. [00:57:00] [Client thread/INFO]: [CHAT] [Server] <> Scheduled Restart: Server will restart in 2 minutes. [00:57:28] [Client thread/INFO]: [CHAT] <[VIP] ~VieuxRiche> kys? [00:57:37] [Client thread/INFO]: [CHAT] <[VIP] ~VieuxRiche> did you just threaten my actualy life? [00:57:46] [Client thread/INFO]: [CHAT] <[VIP] ~VieuxRiche> something that's actually against the rules? [01:07:39] [Client thread/INFO]: [CHAT] Warping to v-maze. [01:10:37] [Client thread/INFO]: [CHAT] [Lockette] You don't have permission to use this door. [01:12:54] [Client thread/INFO]: [CHAT] <[VIP] ~CyphurTheFox> btw wesos, given how rich you are, I dont think you'll care about the contents of one measly chest, would you? Wesos, I must ask, why the hell did you just go and hunt down a brand new player (CMTGIRL) for no reason? are you trying to scare them off and kill the server? Cleary a violation of our rules, and I know hes been warned in the past for breaking these rules. I would suggest a tempban but ill let someone else decide. Its nice knowing he got punished over that, but tbh I don't care too much about the punishment. What I care about is the sword, Shovel, Axe, bow, and Pick of mine that he ended up with. I managed to nab my armour and elytra before he could pick it up, but the tools were taken. After Wesos's violation of the peace agreement, Green showed up. I don't know what hot water was going on with him and wesos, or if wesos was just in a kill everything mood, but wesos TP killed green. No public peace agreement was set up, and it was evident from what happened in the chat that Greenmolay was expecting this and packed accordingly, (specifically packing absolutely nothing) wesos threw around banter trying to egg us into fighting him while I was busy trying to replace my lost gear. Credit where it's due, I suspect Greenmolay is a bit of a sociopath, as he is a master manipulator when it comes to egg people on. The two of us did a bit of prepping to try to at least have a fighting chance with pots (which failed BTW) It was around this time that CMTGIRL joined the server. Wesos accused her/us multiple times of her being an alt of ours and tried to insult us over it. Meanwhile, SlushyGoo had shown up and both Green and she had tpa'd CMTGIRL to them and were giving her some "welcome gifts" which evidently included some diamond armor from the advancement logs. I suspect that being a naieve player who had missed out on the arguments of the past few minutes, she accepted a TPA from wesos, likely expecting more "welcome gifts" If the tip of an arrow moving at a couple hundred meters per second at your face as you stand helpless in a pit in the floor of a house in one of wesos's villages with PVP on, qualifies under welcome gifts, then she certainly got what she wanted, though that's not much of a gift if it results in loss of all of your other items. Also if it's necessary I can show where wesos had his TP trap set up. It was a pretty basic trap, two block deep hole with hoppers at bottom. Would it also be relevant that he violated a no-kill with me? If you take a look at the screenshot I attached he asked me to tp, so I asked him for no kill, and he said "ok then" which I interpreted as an agreement to my no kill.